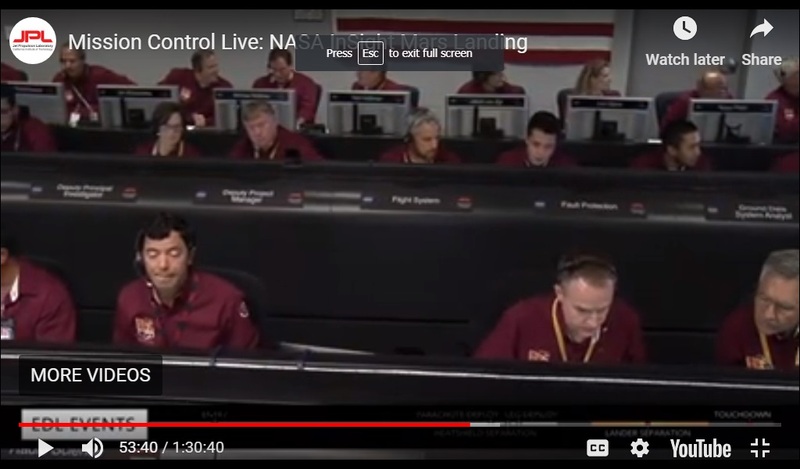 I have seen that many NASA employees (see the picture) were present in the control room when InSight landed on Mars on November 26, 2018. What I did not see is what exactly those people saw on their monitors while the lander came down and finally touched the ground. Are there on the net some examples of screens, or videos, that present to the NASA operator the telemetry data coming from Mars during a landing operation? Those people in the control room just see various things on their screens (see the attached image). It is quite evident that not all the monitors show the same data. 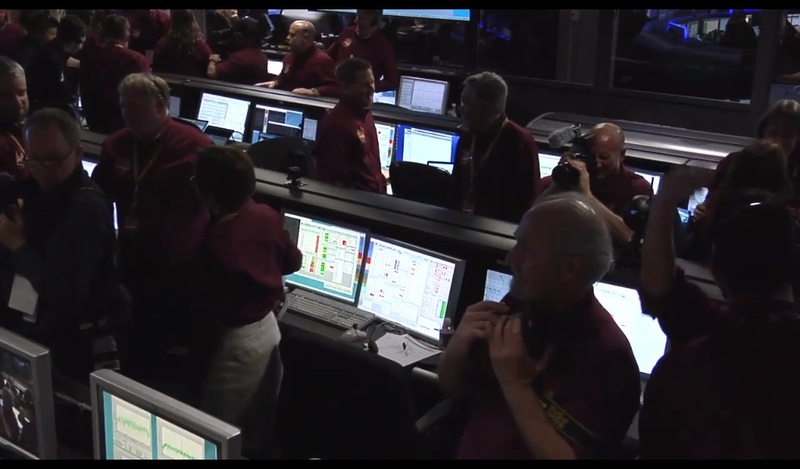 NASA JPL Mission Control Room, shortly after a woman said "Touchdown confirmed." Watch this video, especially after minute 53. However, it is a bit baffling that immediately, seconds after the moment a voice said "Touchdown confirmed", most of the people demobilized, left their sits and never returned to their computers. It would have been more logical to rise their hands, applaud, stand up (manifest their joy) for a few moments but after that they should have returned in front of the monitors had they really supervised data sent by InSight. What if something bad had happened minutes after the landing like a minor fault in the beginning that would have slowly evolved in a catastrophic failure unless a prompt command from earth had fix the problem?! It looks to me that most of those people there were a kind of extras. They had no real role in controlling and supervising InSight. Here is one example (this is ESA actually), I am sure there will be others posted. 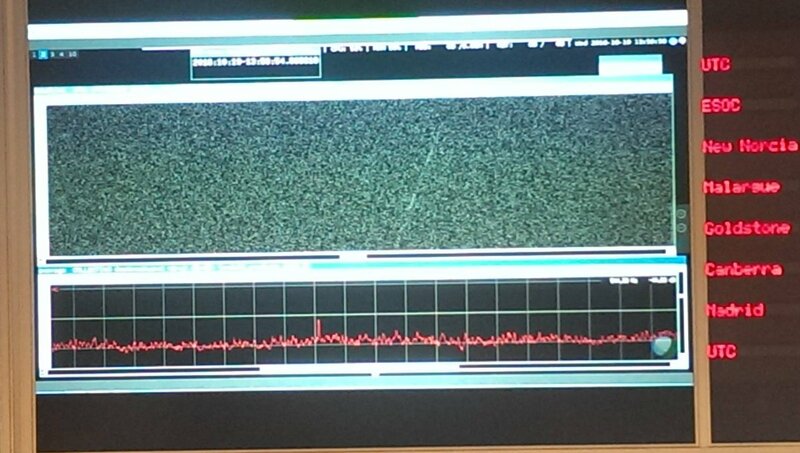 This is a 2D histogram for the ExoMars Schiaparelli Lander, Schiaparelli’s UHF Signal captured by GMRT prior to Entry – Photo: ESA Data was received from the Giant Metre Wave Telescope in India. See Was the time of Schiaparelli's landing chosen specifically so the Giant Meter Wave Radiotelescope could listen? This answer to the question Why will radioastronomy telescopes be used to listen to InSight's entry into Mars' atmosphere instead of DSN? mentions that a similar check was done for direct measurement of InSight, as well as for Curiosity/MSL. No doubt at least some people would have been watching their screens for confirmation of the existence of a prompt landing signal, or a sudden change the rate of change of its Doppler shift. Not the answer you're looking for? Browse other questions tagged mars data-transmission telemetry or ask your own question. Can the rovers on Mars see the comet flyby? When is Christmas on Mars? How does fuel requirement change with mass when traveling from cislunar orbit to Mars? What would happen if an astronaut took off their helmet on mars?